Up until now I had been of the thought that our only guru is shabad guru and had been evasive of any pictures of gurus, simply because I was taught to focus on the word – waheguru . Recently I became aware of the importance and value of the ‘seen’ before the “unseen”. We live in a materialistic world of senses and only after one has had the good fortune of developing the “sixth sense” does one get the awareness of the shabad guru, as our consciousness. I noticed that if I see a picture of a holy person, be it a saint or a bhagat, the serenity, the history, the love of the devotees behind the images, has almost definitely sparked love within me and left me with the aspiration to become more like them in my present life. This inspired me to attempt to do a portrait of one of our Masters. Although there are already several beautiful images of our sixth master, I was driven by the thought of trying to portray a more historically correct version of the sixth master, on that blessed day when He in His immenseness released 52 Hindu kings from the Gwalior Fort. This whole emotion was sparked by the discovery of the actual chola which Guru ji was wearing on that particular day. The chola is lovingly being preserved at Gudani Kallan in Punjab. Up until now all portraits of Sri Har Gobind Singh ji have been painted showing an imaginary chola and just a few kings behind him. Also some pictures do not do justice to his true towering personality. Research (Suraj Parkash, Isht Guru Chamatkar) revealed that not only was our sixth master majestic in His physical presence (towering – over 7ft tall and around 250lb), he was only 19 years old at that time. When the time came for Guru Sahib Ji to leave the prison he insisted that the princes and rajas be released also. Jahangir, the emperor, stipulated that however many could hold on to Guruji’s chola may leave with him. I wondered about the tassels that have often been shown, but never did make any sense. I was fortunate enough to find Namita Jaspal, director and chief conservator of Heritage Preservators, who had the good fortune and blessings to restore Guru Sahib’s Chola Sahib. She very kindly guided me about the correct size, colour and erased the myth that there were 52 strings. The Chola Sahib itself just has a very wide girth. Guru Hargobind (1595-1644) became the sixth Master of the Sikhs at the age of only 11 years. He, like Guru Gobind Singh was instrumental in witnessing the immense sacrifice of His own father, the fifth Master, Guru Arjan Dev Ji. At such a young age he was not only able to forgive but love unconditionally. Lovingly called, Bandichhor (Liberator Benign), He received His early education and training at the hands of two revered Sikhs of that time Bhai Gurdas and Baba Buddha ji. According to Mahima Prakash, He arose three hours before daybreak and sat in seclusion, to concentrate on the Divine. Then he dressed himself and repaired to the presence of the Holy Book and began to recite it silently. None could fathom the depth of his spiritual absorption. None entered to interrupt him. At the advice of his father, he was the first guru to introduce the notion of being a warrior saint, and embracing the two swords of miri (temporal authority) and piri (spiritual authority). Opposite the Harmandir Sahib, the symbol of piri, there is a building known as the Akal Takht, the symbol of miri. 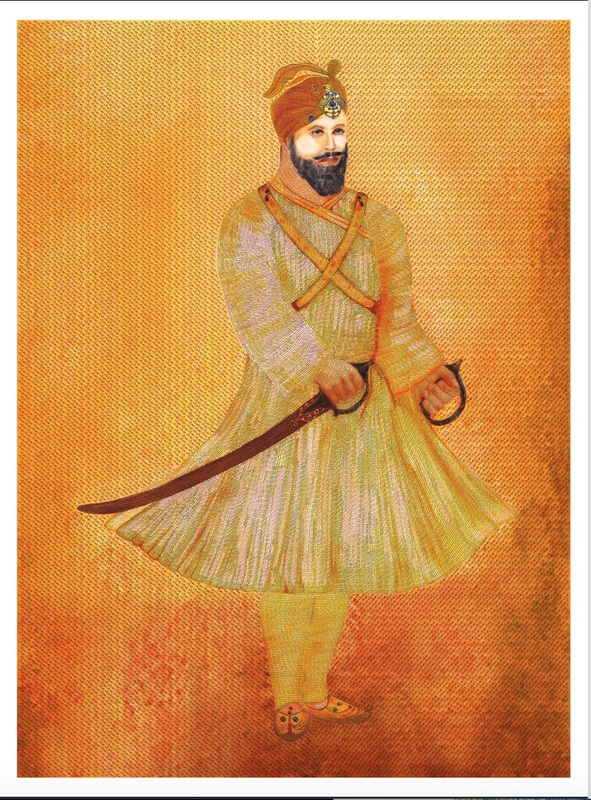 Thus, when Hargobind stood between the Harmandir Sahib and the Akal Takht and buckled on two swords, the message was clear: He possessed both spiritual and temporal authority. My humble attempt is to produce a painting that depicts Guru Ji ready to leave his room just before the “walk out”. Dedicated at his lotus feet, I hope and pray that this portrait does justice to My Master; The Sixth Nanak.